Dr. Myra Adele Logan was born in 1908 in Tuskegee, Alabama. She graduated from Atlanta University in 1927 as valedictorian of her class. She earned her masters degree in psychology at Columbia University before completing medical school at New York Medical College in 1933. She completed her residency at Harlem Hospital in New York and subsequently became an associate surgeon there. In 1943, Dr. Logan became the first woman to perform open heart surgery. Later in her career she changed her focus to breast cancer, developing new Xray processes to more accurately detect the differences in tissue densities and thus identify tumors much earlier. 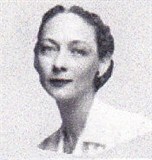 In addition to maintaining a private practice, she was also a charter member of one of the first group practices in the nation, the Upper Manhattan Medical Group of the Health Insurance Plan, composed of physicians of various specialties under one roof - still a common medical model today. Because of her significant contributions to medicine, Dr. Logan was elected to the American College of Surgeons, the first African American woman to earn that distinction. She was also committed to social issues and was an active member of Planned Parenthood and the NAACP throughout her life. She died of lung cancer in 1977.